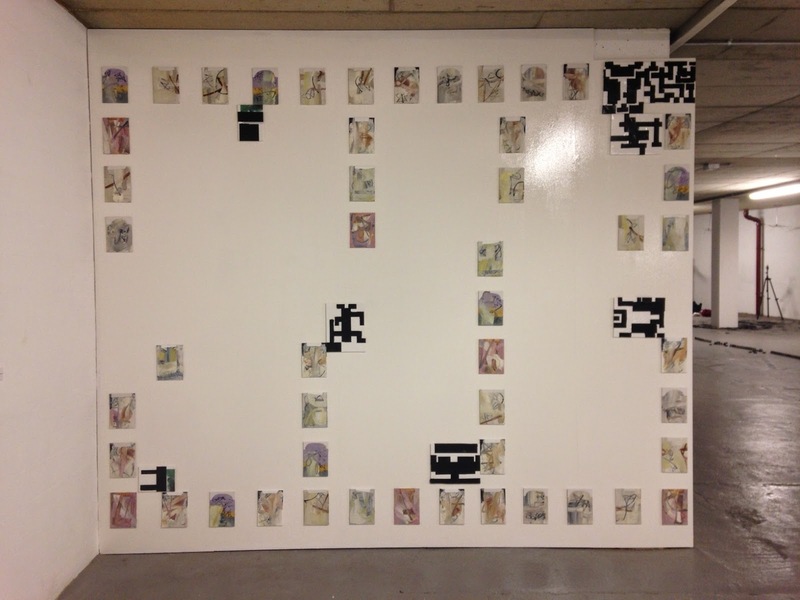 Fifty is a painting installation of 50 small scale abstractions with 8 duct taped canvas boards on show at the Undercroft, Norwich, a group show by the Lonely Arts Club and is on until 27th of September. Space is 244 x 305cm, each painting 13 x 18cm acrylic charcoal and oil on canvas board and 20 x 25cm duct tape on wrapped canvas board, 2013. I was keen to see how drawing or drawn elements could be assimulated into the process. Working with the charcoal line in wet oil through transferring drawings onto the surface from scraps of paper, gave me an indeterminate element in the compositions. So the given quality of the line; crisp or muddied, acted as reference points. I am interested in how an idea of geometric precision can try to hold up in the act of painting. By the heat of the gesture, trying to hold its own, through manipulation of how the paint is applied; negated or counterpointed. The show at the Undercroft was the right opportunity to present the work as a whole. Being able to view the paintings with and against each other in a configuration, came after the intention to begin the paintings. Being able to view the paintings together as if it was one big painting was something I thought about. It became a game-playing of arrangement, the organising of composition, so a continued thought process from the making. The constraints being the dimensions of each painting, on the designated space in the gallery. For the installation there are 8 ‘paintings’, although they are in fact still shop wrapped. I wanted something with more visual immediacy to see how their quality could work against the nuanced subtleness of the paintings. For the show my first thought was to paint on the canvas boards, but this raised too many questions. Not that I should shy away from this, but the graphic quality is more obviously different and the process of tearing and sticking offers alternative suggestions than could be achieved with paint. To find out what I do with paint and perhaps ask why do I do certain things.. To see how we make relationships with things through looking.